Royal free city of Kolozs county, Hungary; formerly capital of the grand duchy of Transylvania (1691-1848). Until 1848 no Jews were legally allowed to live in Klausenburg; but the law of 1526, by which the Jews were expelled from Hungary and Transylvania, was not strictly carried out. In 1578 the Transylvanian Diet decreed that the Jews might stop temporarily in the cities when visiting the fairs. Goods are mentioned as being imported by Jews into Klausenburg as early as 1591. When Klausenburg was captured by the imperial general Georg Basta, Sept. 13, 1600, all the Jews in the city were slain. This did not deter others from visiting the fairs there; for in the annual balance of the city custom-house for the year 1631 the "Jews' linen" is especially mentioned. About the middle of the seventeenth century an edict of the ruler ("Approbatae Constitutiones Regni Transylvaniae," pars v., ed. 82) assigned to them for their exclusive habitation Carlsburg, the temporary residence of the princes of Transylvania. Thence they continued to visit the fairs of Klausenburg so frequently that the general city council on March 7, 1693, set apart for them an especial place in the market. With the act of exclusion still in force, a Jew, Löbl (Leopold) Deutsch by name, succeeded in settling in the city about 1770-80. This marks the beginning of a lengthy struggle for the right to settle and trade in Klausenburg between the Jews and the municipal authorities, the latter being in league with the state government. Supported by an imperial decree of 1781, which in accordance with one of an earlier date restricted the right of settlement of the Jews in Transylvania to Carlsburg, the authorities steadily refused to admit Jews into Klausenburg. But the latter had obtained a footing in the city. Although Löbl Deutsch and those that followed him even fifty years later were threatened with expulsion, this threat was only partially carried out, and a certain number of Jews remained permanently in the city, though merely on sufferance. This struggle ended only in the stormy days of 1848. The number of Jews in Klausenburg gradually increased. In 1780 there is no official record of a single Jew in the city, although in the county of Kolozs eight Jews were found. But in 1785 there were twelve Jews in a population of 9,703 persons. Within fifty years (1835) the number rose to 109; in 1846 there were fifty-six Jewish families, sixteen of which, however, being new arrivals, were to be expelled. 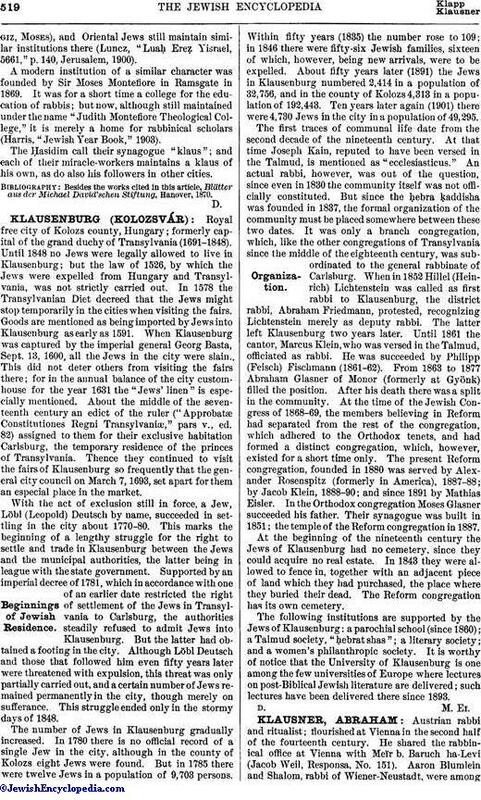 About fifty years later (1891) the Jews in Klausenburg numbered 2,414 in a population of 32,756, and in the county of Kolozs 4,313 in a population of 192,443. Ten years later again (1901) there were 4,730 Jews in the city in a population of 49,295. The first traces of communal life date from the second decade of the nineteenth century. At that time Joseph Kain, reputed to have been versed in the Talmud, is mentioned as "ecclesiasticus." An actual rabbi, however, was out of the question, since even in 1830 the community itself was not officially constituted. But since the ḥebra ḳaddisha was founded in 1837, the formal organization of the community must be placed somewhere between these two dates. It was only a branch congregation, which, like the other congregations of Transylvania since the middle of the eighteenth century, was sub-ordinated to the general rabbinate of Carlsburg. When in 1852 Hillel (Heinrich) Lichtenstein was called as first rabbi to Klausenburg, the district rabbi, Abraham Friedmann, protested, recognizing Lichtenstein merely as deputy rabbi. The latter left Klausenburg two years later. Until 1861 the cantor, Marcus Klein, who was versed in the Talmud, officiated as rabbi. He was succeeded by Philipp (Feisch) Fischmann (1861-62). From 1863 to 1877 Abraham Glasner of Monor (formerly at Gyönk) filled the position. After his death there was a split in the community. At the time of the Jewish Congress of 1868-69, the members believing in Reform had separated from the rest of the congregation, which adhered to the Orthodox tenets, and had formed a distinct congregation, which, however, existed for a short time only. The present Reform congregation, founded in 1880 was served by Alexander Rosenspitz (formerly in America), 1887-88; by Jacob Klein, 1888-90; and since 1891 by Mathias Eisler. In the Orthodox congregation Moses Glasner succeeded his father. Their synagogue was built in 1851; the temple of the Reform congregation in 1887. At the beginning of the nineteenth century the Jews of Klausenburg had no cemetery, since they could acquire no real estate. In 1843 they were allowed to fence in, together with an adjacent piece of land which they had purchased, the place where they buried their dead. The Reform congregation has its own cemetery. The following institutions are supported by the Jews of Klausenburg: a parochial school (since 1860); a Talmud society, "ḥebrat shas"; a literary society; and a women's philanthropic society. It is worthy of notice that the University of Klausenburg is one among the few universities of Europe where lectures on post-Biblical Jewish literature are delivered; such lectures have been delivered there since 1893.